Introduction: To discover the life-giving power of the Holy Spirit is one of the greatest experiences a human being can undergo. Consequently, here are ten suggestions for drawing closer to the Holy Spirit. In The Holy Spirit, a great spiritual writer, Father Edward Leen, says that “Christians do not dwell as they ought on the immense advantages that they may derive from the intimate friendship which the Holy Spirit is eager to establish between them and himself, as God.” Father Leen continues: “The Holy Spirit has…an infinite capacity for friendship….The Holy Spirit is laden with all the secrets of God – secrets not only of surpassing interest in themselves but of great import for the creature. These deep things of God the Holy Spirit is all eagerness to communicate to the soul, as in the tendency of friendship. Unfortunately, the creature, too often, is a listless and inattentive listener….” It is my hope that one or more of the following suggestions might increase your friendship with the Holy Spirit, who is the very source of the Divine friendship. “[The Holy Spirit]”has some very special gifts, seven in number, with which he works in souls; they are marvelous tools, undreamed possibilities of grandeur of soul, unsurpassed forms of beauty, working miracles with our nature without doing violence to them; by them we touch, and taste, and relish, what we know by faith” (F.W. Faber, Notes on Doctrinal and Spiritual Subjects,Vol. 1, p.80). Comment: The rushing wind at Pentecost (Acts 2:2). Every rush of wind, every breeze, can serve as a powerful reminder of the Holy Spirit. See also CCC 694. Just like we need water to live, so too do we need the Holy Spirit for spiritual life. We use water to cleans and nourish us: these are images which draw us into the life of the Holy Spirit. We can also use Holy water in our homes. Anointing. The symbolism of anointing with oil also signifies the Holy Spirit, to the point of becoming a synonym for the Holy Spirit. In Christian initiation, anointing is the sacramental sign of Confirmation, called “chrismation” in the Churches of the East. Its full force can be grasped only in relation to the primary anointing accomplished by the Holy Spirit, that of Jesus. Christ (in Hebrew “messiah”) means the one “anointed” by God’s Spirit. There were several anointed ones of the Lord in the Old Covenant, pre-eminently King David. But Jesus is God’s Anointed in a unique way: the humanity the Son assumed was entirely anointed by the Holy Spirit. The Holy Spirit established him as “Christ.” The Virgin Mary conceived Christ by the Holy Spirit who, through the angel, proclaimed him the Christ at his birth, and prompted Simeon to come to the temple to see the Christ of the Lord. The Spirit filled Christ and the power of the Spirit went out from him in his acts of healing and of saving. Finally, it was the Spirit who raised Jesus from the dead. Now, fully established as “Christ” in his humanity victorious over death, Jesus pours out the Holy Spirit abundantly until “the saints” constitute – in their union with the humanity of the Son of God – that perfect man “to the measure of the stature of the fullness of Christ”: “the whole Christ,” in St. Augustine’s expression (695). Comment: These symbols help us to image the invisible Holy Spirit. They are aids. The Holy Spirit is not air or water. We are not pantheists. However, God is present in nature by his power, presence and essence. Moreover, the Holy Spirit does truly indwell in our souls by sanctifying grace. Comment: By way of sanctifying grace received at baptism the Holy Spirit actually and really indwells our souls. Therefore in interior prayer the ultimate aim is to bypass mediated or symbolic knowledge to go directly to the Holy Spirit (the end result of which is entry into mystical prayer which is ultimately a grace). The CCC discusses interior prayer under the heading of “Contemplative Prayer” in paragraphs 2709-2719. Also, Saint Teresa of Avila’s classic, Interior Castle, discusses in detail the practice of interior prayer. It is prudent to have a spiritual director when attempting this form of prayer. Contemplative or interior prayer differs from meditation in that meditation involves discursive images and symbols whereby contemplative prayer seeks to transcend discursive or symbolic knowledge and go more directly to God. I would recommend, to begin this method of prayer, a short book called Progress in Divine Union by Father Raoul Plus. Comment: These seminars, which aim to draw one into a closer experience of the Holy Spirit, are offered from time to time at various Catholic parishes. The good folks at Renewal Ministries in Ann Arbor may have more information about attending such a seminar, and a wealth of information on devotion to the Holy Spirit (renewalministries.net). Comment: Pray the Veni Creator Spiritus! In his book Mystics and Saints, the saint expert, Bert Ghezzi, states: “I have noticed an intriguing thread running through the lives of several mystics we have observed. God touched them in extraordinary ways when they prayed the Veni Creator Spiritus, the ancient hymn to the Holy Spirit.” This beautiful prayer is widely available on-line and is in most Catholic prayer books. 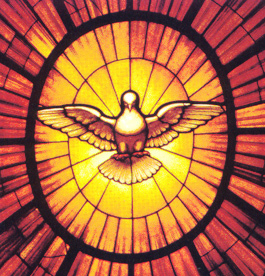 Image: The lead image is a picture of a stained glass representation of the Holy Spirit as a dove from St. Peter’s Basilica in Rome, circa 1660, by Gian Lorenzo Bernini (Public Domain, U.S.A.). Thank you Tom Mulcahy for this wonderful post. God bl;ess you.